Hirez Expo is starting off with a bang this time, with some truly exceptional announcements. 2019, in general, is going to be a very exciting time for not just SMITE fans, but Paladins and Realm Royale. On a personal note, I think SMITE wins on the bulk of sheer exciting announcements, even if I love the idea of “Imani, the Last Warder”. Both SMITE and Paladins both announced that they will be bringing Cross-Progression and Cross-Platform to the Nintendo Switch, PC, and Xbox One. I love PlayStation, but they sincerely need to catch up with the rest of the gaming world. We’re going to go into that in our video interviews, which should be up on the Youtube channel very soon, but the idea of Cross-Progression appeals to me the most. The Cross-Platform isn’t as important to me on a personal level, but constantly having to start over whenever Paladins comes to a new platform is absolutely infuriating. That’s the only thing that has stopped me from actively playing Paladins on the Switch is having to start over. I’m curious to see if it will catch up to where I am on the PC, and even on my PS4, which is only mildly behind my PC account. So I want to highlight a few of these exciting announcements. 2019 seems to be the year of “Fan Requests”. That doesn’t mean “Spam Ajax with inane requests”, either. But there are some gods that are coming this year are ones that have been requested for years now. But that’s not where we’re starting. We learned first that King Arthur and Merlin are on the way next. That’s right, Arthurian legend is on the way to SMITE! King Arthur is going to be a mechanically complex Warrior that will offer some new, exciting ways to play, and of course, Merlin will be a Guardian. I mean, Guardians do magic damage, right? Of course, Merlin will be a Mage. That’s not a shocker (but I would love to be wrong). As of this writing, I have no further news about either, but I’m hoping we’ll learn more about them in our interview sessions later today. There seems to be some unwritten community rule that “Pantheons need to be finished”. Why, though? If other, more fun idea comes up, why not work on that instead? And speaking of that. . . While Arthur and Merlin are not “Gods”, they are legendary, mythological figures with a rich lore were respected, honored, and feared. They will fit in with this game just fine. But what about those “fan requests”? Two of these Gods announced were the Egyptian Gods Horus and Set/Sutekh. In addition, the World Serpent Jormungandr. I do not have a schedule for these, but they are coming. Set is one of the Egyptian gods I personally wanted to see, so I’m over the moon for this announcements. 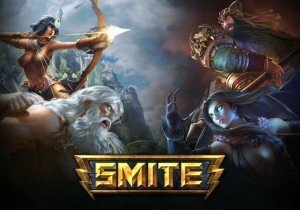 SMITE also announced that it’s coming to the Nintendo Switch! Closed Beta begins on January 24th, 2019, but the bundle can be pre-ordered as of today. With this Founder’s Pack bundle, players receive the Ultimate Gods Pack (all gods now and forever), 400 gems, the “Dashing Deceiver” Loki skin, and the “Dragon Empress” Scylla skin, which is only available in this limited offer. My favorite announcement of all of these is the Arena Update! A new map, with a new story that is focused on Hera, Queen of the Gods doing battle with Bellona, the Goddess of War. With this updated art style comes a new “Bomb” Minion, the Minotaur, that will siege the other side of the Area. I’ve been waiting on the Arena design with baited breath, as its my favorite mode. Do stay tuned for more on that. The 40th character for Paladins may be their most ambitious yet: Imani, the Last Warder. They’re a damage champion with command over ice and fire magic; if that’s not enough, she also summons a dragon to demolish her foes. Her arrival will be the culmination of the “Dragon’s Call” story, which goes back to early August. Her arrival also heralds a new story, much like a new novel or comic series. That’s something I’m definitely excited for. I’m a sucker for interesting lore, and the growth of Paladins as a game has been terribly fascinating, and I cannot wait to see where it takes us next. That leads me to their final major announcement, The Assembly of Champions. Paladins players will play a role in the game’s evolution during Season 2, thanks to the new Assembly of Champions. This democratically-elected player council will assist Evil Mojo in the continuous development of Paladins by representing the community’s interests across multiple platforms and demographics. Elected delegates will sit for one year and represent the community in regularly scheduled meetings with each other and with Paladins developers. My fear is that this will boil down to a popularity contest, and those people that are elected will not have anyone’s best interest in mind but their own, but I will choose to err on the side of optimism. I can se it going horribly awry, but I don’t think that will be the case. Lastly, Paladins will focus on improving quality throughout Season 2 with The Hunt: a new initiative focused on process improvements and polish. Patch 2.01 will enter public test servers on December 17, giving the Paladins team more time than ever to hunt out and squash bugs. Evil Mojo is also expanding their programming and QA teams, and devoting 20-40% of each development cycle to polish. CityState Games is in the process of a massive end of year tech reveal showcasing livestreaming of alpha footage.